J.D. 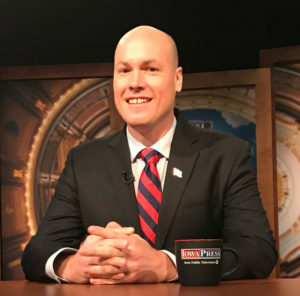 Scholten, the Democrat challenging Republican Congressman Steve King, says the end of “straight ticket” voting in Iowa may give his own campaign a boost this year. Those 2016 voters Scholten is talking about were picking and choosing among the candidates rather than checking the box to vote for all the Republicans on the ballot. Now that such “straight ticket” voting for all the candidates of one party is no longer an option in Iowa, Scholten says he expects more GOP voters to skip voting for King this year. There are 70,000 more active Republican voters than Democrats in the fourth district. King has easily won the district in the eight previous elections, but Scholten suggests King’s hard-line stance on immigration is wearing thin in the area. Scholten says small business owners all across the political spectrum tell him they need workers. Scholten says the country “absolutely” needs secure borders, but it also needs an improved VISA program to help businesses get guest workers. The process of becoming a naturalized system must be improved as well, Scholten says. Scholten made his comments this morning during taping of Iowa Public Television’s “Iowa Press” program that airs tonight at 7:30.